FACT CHECK: Did Steve Scalise Attend a White Supremacist Convention? Did Steve Scalise Attend a White Supremacist Convention? "Throughout his career in public service, Mr. Scalise has spoken to hundreds of different groups with a broad range of viewpoints." House Majority Whip Steve Scalise was a guest speaker at a 2002 white supremacist organization's event. The dozen years elapsed between the EURO event in 2002 and the article’s publication in 2014 made it markedly difficult to investigate the article’s claims. At the time of the convention, much internet-based political discussion occurred solely on message boards, many of which have long since been retired due to inactivity, abandoned, or became otherwise inaccessible for a variety of reasons. Following the article’s publication, the claim was circulated and reposted on a number of left-leaning web sites. This repetition created the impression multiple sources were documenting the claim, but the information all pointed back to the same single source: Stormfront.org, a white supremacist message board with a lengthy and notorious history on the web. In addition to plans to implement tactical strategies that were discussed, the meeting was productive locally as State Representative, Steve Scalise, discussed ways to oversee gross mismanagement of tax revenue or “slush funds” that have little or no accountability. Representative Scalise brought into sharp focus the dire circumstances pervasive in many important, under-funded needs of the community at the expense of graft within the Housing and Urban Development Fund, an apparent give-away to a selective group based on race. There was also a call for the many women active in the movement to not only let their voice be heard, but their presence known. Recognizing the duties placed on white mothers to maintain decreasing birth rates, it was an appropriate call to arms to emphasize the unity message forming the basis of EURO. Throughout his career in public service, Mr. Scalise has spoken to hundreds of different groups with a broad range of viewpoints. In every case, he was building support for his policies, not the other way around. In 2002, he made himself available to anyone who wanted to hear his proposal to eliminate slush funds that wasted millions of taxpayer dollars as well as his opposition to a proposed tax increase on middle-class families. He has never been affiliated with the abhorrent group in question. The hate-fueled ignorance and intolerance that group projects is in stark contradiction to what Mr. Scalise believes and practices as a father, a husband, and a devoted Catholic. Q: Please walk me through how you came to appear at the white nationalist event. A: “I don’t have any records from back in 2002, but when people called and asked me to speak to groups, I went and spoke to groups. It was myself and [former state Sen.] James David Cain who were opposed to the Stelly tax plan. I was the only legislator from the New Orleans area who was opposed to the plan publicly, so I was asked to speak all around the New Orleans region. I would go and speak about how this tax plan was bad. I didn’t know who all of these groups were and I detest any kind of hate group. For anyone to suggest that I was involved with a group like that is insulting and ludicrous. 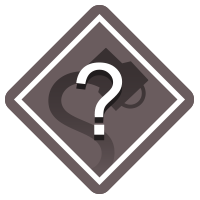 Q: You don’t remember speaking at the event? A: “I don’t. I mean I’ve seen the blog about it. When you look at the kind of things they stand for, I detest these kinds of views. As a Catholic, I think some of the things they profess target people like me. At lot of their views run contradictory to the way I run my life. Knight invited then–state Rep. Scalise as well as a representative from the Jefferson Parish Sheriff’s Office and a person from the American Red Cross to speak to the civic association at the hotel. Barbara Noble, Knight’s then-girlfriend who was also present at the hotel event, corroborated Knight’s account. Kenny Knight [said] that he was not a member of the European-American Unity and Rights Organization, but documents filed with the Louisiana secretary of state’s office list him as treasurer of its predecessor, the National Organization for European American Rights, in 2000. 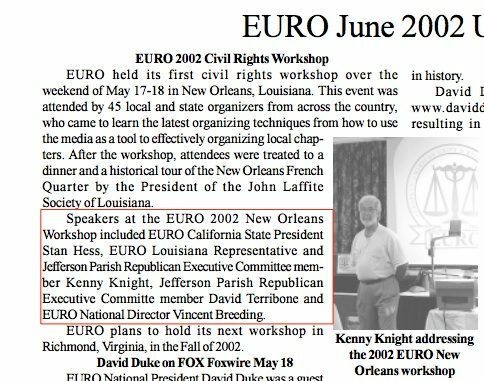 Further, a May 16, 2002, news release on an an archived version of EURO’s former website, www.whitecivilrights.com, lists Knight as “EURO Louisiana State Representative Kenny Knight.” The release says Knight was expected to address the group’s May 17-18, 2002, conference. Former Ku Klux Klan leader David Duke said that his longtime political adviser, Kenny Knight, was “friendly” with House Majority Whip Steve Scalise in 2002, and cited that relationship as the reason Scalise accepted an invitation that year to speak at a gathering of white supremacists. Duke recalled Scalise as a “nice guy” and said he was invited to the conference by two of Duke’s longtime associates: Howie Farrell, who had worked on Duke’s gubernatorial campaign, and Kenny Knight. Duke, who spoke to the crowd remotely, recalled Knight reaching out to Scalise in the weeks before the conference to come and update attendees on state affairs, and that Scalise accepted without reservation. Duke said he spoke to the conference twice, once by phone and later by video hookup. But he did not hear Scalise speak, he said, and does not know whether Scalise heard him speak.